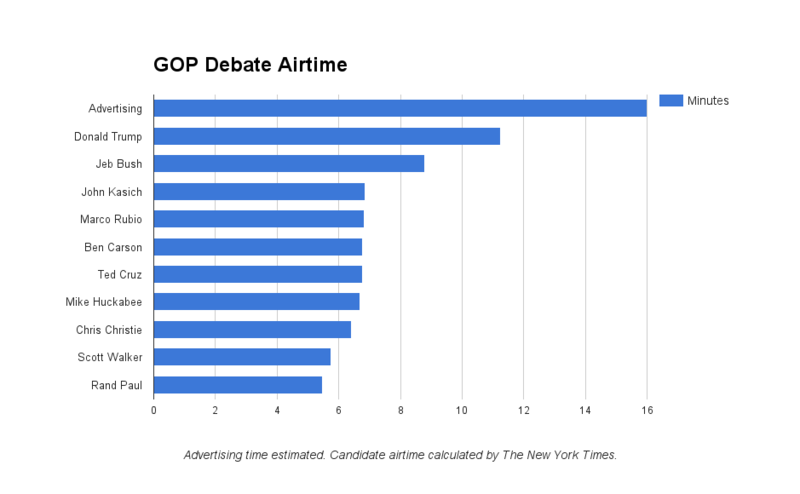 Who had the most airtime during the GOP debate? Advertisers. Here’s a breakdown of how much airtime each candidate, and advertisers, received during Thursday’s GOP presidential candidate debate aired on Fox News Channel. Thursday’s debate of Republican candidates running for president in 2016 on Fox News Channel turned out to be pretty exciting. While most of the post-debate analysis has been focused on what the 10 candidates said, some are looking at how much airtime each candidate received. I took it a step further and considered how many commercials aired during the program. My findings? Advertisers handily won the airtime battle. I didn’t have a stopwatch, but based on my review of the broadcast, I estimated Fox News aired a total of about 16 minutes of commercials during six breaks. If it’s correct, that means that commercials took up a larger portion of the 2+ hour-long debate than any of the individual candidates. That’s more than current frontrunner Donald Trump’s 11 minutes and 14 seconds, as calculated by The New York Times. Ads had nearly triple the airtime of Wisconsin Gov. Scott Walker, who was one of the leading candidates. Since Fox News was running the show, it could and did take commercial breaks during the event’s scheduled two-hour running time (it ran over by about four minutes). During the first break after about 30 minutes, The New York Times’ graphics department tweeted a breakdown of how long each candidate spoke during the initial segment. I was interested to see how little time some of the candidates received, especially compared to Trump, who has become a major attraction in this election’s early going. By that point, each candidate had relatively little time to speak — Walker got only 34 seconds, but even Trump got less than two minutes. I was amused by Fox News airing commercials during a civically-oriented event, especially because I’m used to commercial-free debates before the main general election (less than 15 months away!). I was curious if Fox News would have more commercial time than airtime for some of the candidates. Ultimately, I was surprised to see that it’s likely that advertising outpaced _all_ of the candidates instead of just a few. I didn’t have a good way of keeping time of the commercials during the debate, so I tried to collect the data after it ended. Thankfully, I was able to find a Washington Post transcript of the event and a YouTube user’s upload of the entire debate sans ads (that YouTube link may be yanked down due to possible copyright infringement). The video was 1 hour, 49 minutes. Thanks to Fox News showing the time on its rotating channel logo, I could see the recording started at about 5:58 p.m. Pacific daylight time and ended after 8:04 p.m. PDT — about 2 hours, 6 minutes. My math determined there was a 17-minute difference between the two durations. I subtracted about a minute to account for short teaser promos that the YouTube user also edited out, but I don’t have a firm idea of how long those teasers really were. The transcript indicates there were six commercial breaks during the broadcast. If the breaks were of equal length, each one would be 2 minutes, 40 seconds. It’s plausible that there were 15 total minutes of ads — that would make each break about 2 minutes, 30 seconds. Although advertising time dominated over the candidates, 15 to 16 minutes of ads over a two-hour period (or 8 minutes per hour) is extremely light by today’s broadcasting standards. It’s common for networks to air 18 to 20 minutes of commercials an hour. We could have seen nearly 40 minutes of ads during this two-hour event. I initially lamented the intrusion of advertising into a civic event, but many people noted the breaks were relatively short and some enjoyed what was being advertised. On the other hand, some were frustrated by the total number of breaks in the broadcast. While we may argue which presidential candidate won the debate, Fox News and advertisers seemed to win the night as there were predictions of record-breaking cable news audiences. This entry was posted in Entertainment industry, TV, Film and Radio, World at large and tagged advertising, Election 2016, elections, featured, Fox News, GOP, GOP Debate, politics, Republicans, TV by RTOlson. Bookmark the permalink.